Whether you are looking for traditional full frame wood or fiberglass windows or energy efficient vinyl window inserts, we at Royal Restoration, Inc. can help with your window project and needs. 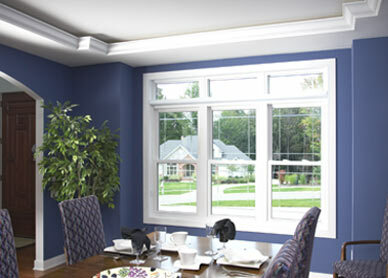 At Royal Restoration, Inc. we offer top-quality, premium double paned and triple paned windows at an affordable price. Since we are a multi-line distributor, you are not limited to one type or design of windows. You can choose from many manufacturers, types, styles, energy efficiencies, colors, and options which all can be custom fit to your openings. With vinyl windows: Whether the vinyl is virgin vinyl or recycled, welded or mechanically fastened. Whether the window frames are insulated. Many people change their windows out for a more practical reason. They have difficulty opening, keeping open, and/or cleaning their current windows. Most all of the windows we carry offer tilt in easy cleaning options, no bulky storm windows to remove, and proven operating systems that allow smooth, easy operation for years to come. With security becoming more and more of an issue these days, some of our window manufacturer’s offer tempered and laminated glass options, making it very difficult for severe storms and intruders to break the window’s glass. In addition, there are security locks, night vent latches, and obscure and special tinted glass to aid in security. Not only will the additional pane(s) of glass offer more noise control, but the argon or krypton gas will help virtually eliminate unwanted outside noise. If you're looking for an experienced, knowledgeable and professional window and door contractor, please give us a call today 763-788-0092 or CONTACT US to request a FREE window estimate.